The Diversified Technique is likely the most commonly applied techniques used by chiropractors and is what patients of chiropractors generally refer to as "getting adjusted." The Diversified Technique can be referred to as a manipulation or adjustment that focuses on restoring the body to normal bio-mechanical function and on correction of subluxation. Subluxations are the main pathology treated by chiropractors and is a chiropractic term that expresses a misaligned relationship between adjacent spinal bones. To medical doctors, a subluxation refers to a partial dislocation of a vertebrae; a serious condition often due to trauma which can result in a spinal cord injury. However, the chiropractic definition of subluxation refers to a "misaligned" vertebrae, not a disconnect between the vertebrae, but instead position changes in the joints and soft tissues of the spine. This "misalignment of vertebrae" is thought to lead to pain and abnormal intervertebral joint motion. 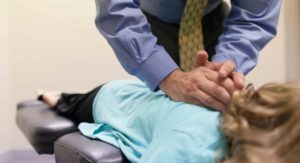 A chiropractic adjustment, also known as chiropractic manipulation, manual manipulation, or spinal manipulation, is a common therapeutic treatment for lower back pain and other conditions treated by chiropractic care. X-rays and a case history of the spine are commonly utilized to determine the steps needed to realign the vertebrae. After analyzing X-rays and the case history, Dr. Neil adjusts the vertebrae using manual thrusts. The thrust is low force and high velocity at specific angles proportional to the angles of the vertebral joints to move the joints to optimal functioning position. Motion palpitation and full spine, hands-on techniques are used to deliver a deeper thrust, which makes an osseous (popping) sound as the adjustment is given. The Diversified Technique can also be used on virtually any joint of the body to produce greater range of motion and improved function.